The big blue world of Nemo and friends came to life earlier this year as Disney’s Art of Animation Resort opened its doors with “Finding Nemo,” the first phase of the new resort offering at Walt Disney World Resort. Opening in phases, each of four distinctly designed wings celebrates rich storytelling, spirited characters, original sketches and playfulness with colorful icons and whimsical theming inspired by classic Disney and Disney•Pixar films. 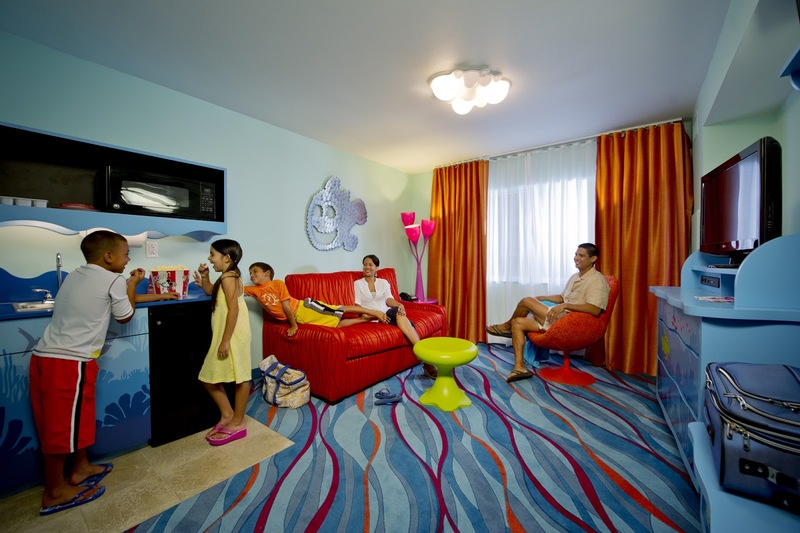 Family suite wings will showcase “Finding Nemo” with 320 suites, “Cars” (opened June 18) with 480 suites, and “The Lion King” (opened Aug. 10) with 320 suites. All the themed areas offer elaborate storytelling both inside and out, from each beloved film depicted. 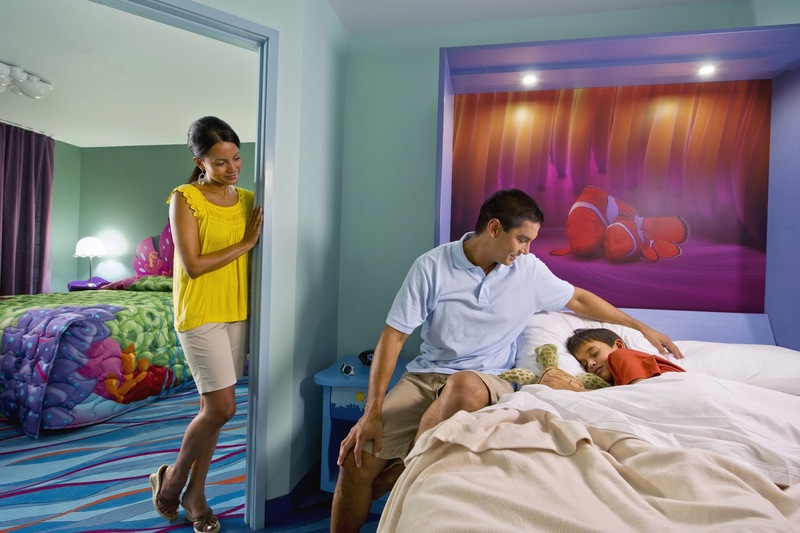 Standard guest rooms will make up “The Little Mermaid” wing, (which opened on Sept. 15) with 864 rooms. The three-story, value-priced resort tells the story of the animation process in phases from pencil drawings to close ups. 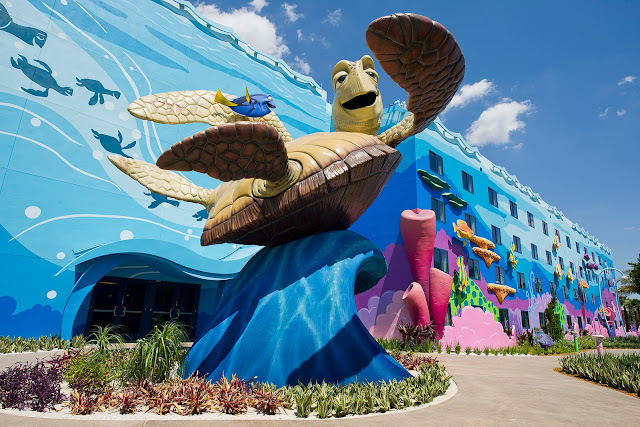 It will immediately transport guests into the worlds of favorite Disney characters and animated films beginning at check-in as pixilated patterns and wavy ribbons of bold colors decorate the resort’s exterior. Pencil drawings of Ariel, Lightning McQueen, Nemo and Simba adorn the entryway, and a whimsical chandelier composed of 77 animation storyboards enhances the lively and modern Animation Hall lobby. 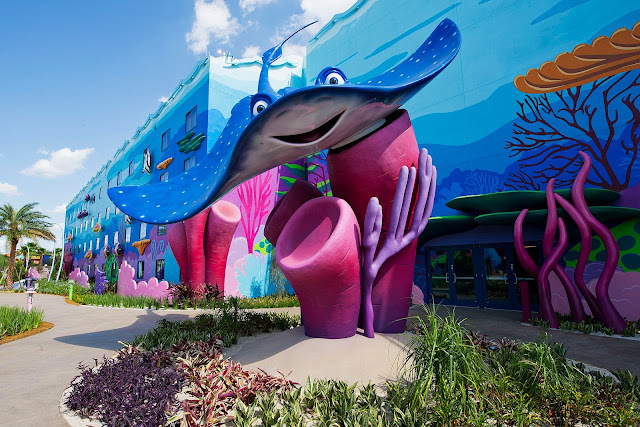 “Our goal was to make guests feel like they have been immersed in the artistry and enchantment of Walt Disney and Disney•Pixar animated classics,” said Walt Disney Imagineer Frank Paris. Giant sketchbooks filled with favorite characters seem to come to life as they pave the way to each storyline revealed. 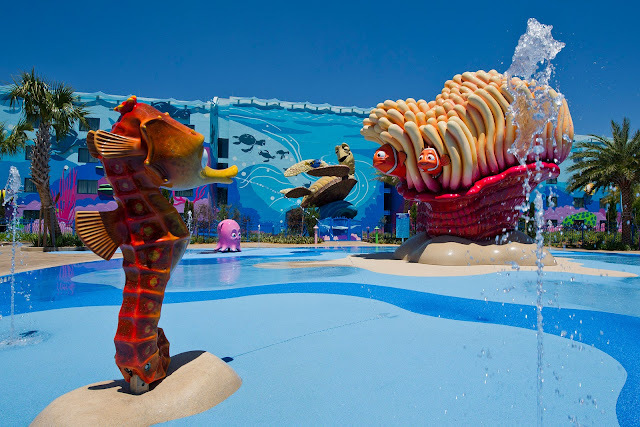 Scenic settings, icons—including a brightly-colored coral landscape, a 35-foot-tall model of King Triton, a towering Mufasa and more—immerse guests into the playful world of animation. At the “Cars” wing, a freshly paved road will lead to the Cozy Cone Motel complete with a Cozy Cone pool and cone-shaped cabanas. It’s a journey through an African landscape in “The Lion King” complete with an elephant graveyard play area that invites youngsters to seek hakuna matata time. Treasures from the human world fill Ariel’s grotto in an under- the-sea kingdom in Little Mermaid courtyard. From linens and carpeting to fixtures and furniture, all details of the guestrooms tie to the storyline. In “Finding Nemo,” there’s coral-shaped chairs and bubble ceiling lights; rusty metallic tiles in the bathroom make guests feel as though they are in the submarine. Zazu takes center stage on the headboards in “The Lion King,” while Pumbaa and Timon decorate the shower curtain. Kids of all ages can make a splash at the “Big Blue” pool, the largest resort swimming pool at Walt Disney World Resort measuring 11,859 square feet. Guests will feel like they are swimming with Dory and Nemo as underwater speakers periodically pipe in music and messages from film characters. Guests will enter scenes from the animated world and can explore the colorful reef and East Australian Current with a giant-sized Mr. Ray whose wings span 27 feet, pose for a picture with Crush or frolic with Squirt in the Righteous Reef, a children’s play area. And the character sketches become three dimensional with some 2,500 sculpted figures decorating the resort’s exterior and interior. The Pixel Play Arcade, Drop Off pool bar, and Ink and Paint gift shop round out the offerings. Kids will enjoy the daily character artist in the “Finding Nemo” lobby, and nighttime movies poolside. There are two additional pools in the “Cars” and “The Lion King” wings as well. Dining options include a poolside snack bar, pizza delivery and Landscape of Flavors food court. Open for breakfast, lunch and dinner, the food court features items such as fresh smoothies, hand-scooped gelato and Mongolian barbecue. Original backgrounds from featured films decorate the walls in the dining area, adding to the attention to detail and sense of immersion. 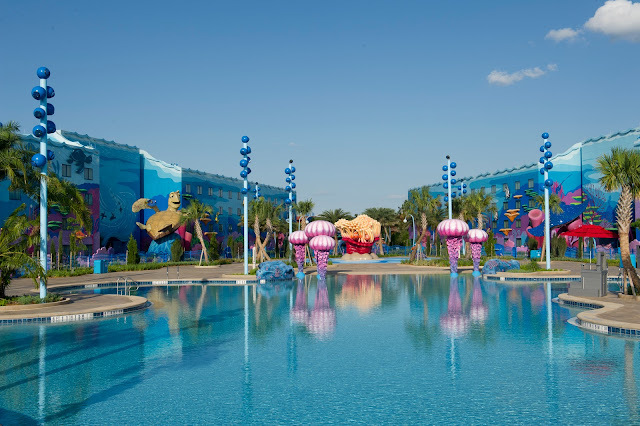 The whimsical property, situated adjacent to Disney’s Pop Century Resort, will open in phases with rates from $248 per night. The 1,120 family suites include two bathrooms, a kitchenette and three separate sleeping areas that can sleep up to six. The 864 standard rooms sleep up to four, with rates as low as $94. 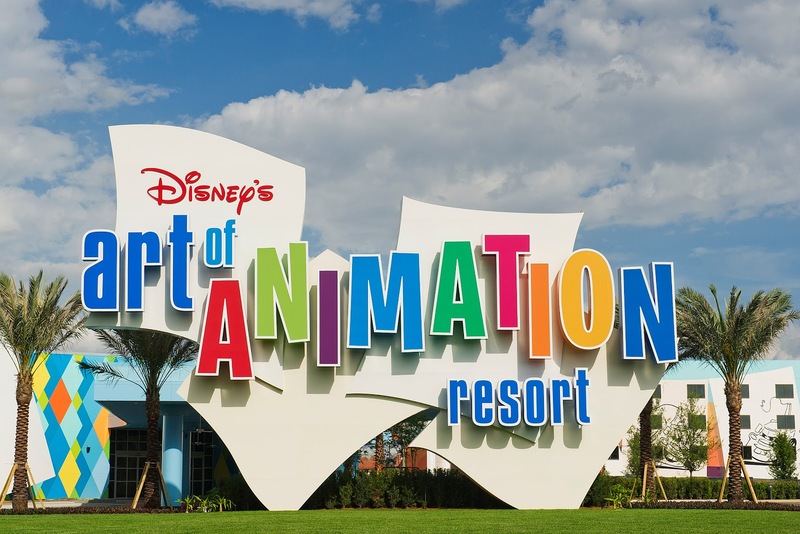 Those staying at Disney’s Art of Animation Resort are treated to complimentary transportation, Extra Magic Hours and other benefits available to a Disney Resort hotel guest. (NOTE: Extra Magic Hours of up to two hours after park close take effect in January-February 2013). For reservations, guests can call 407/W-DISNEY (934-7639) or contact their travel agent.